That’s right! BigBite made its way all the way to Munich, Germany! O Mein Gott!! 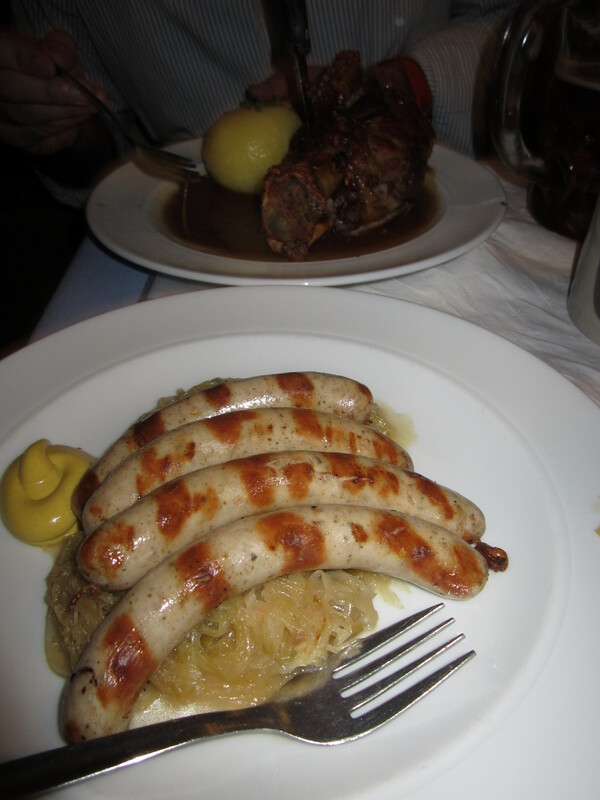 Let me just say…I was not (1) expecting to like Munich or Germany for that matter (don’t ask me why), and (2) expecting to at all like the food (although the only Geman food I could identify was sausage and sauerkraut). I was wrong, wrong, wrong! 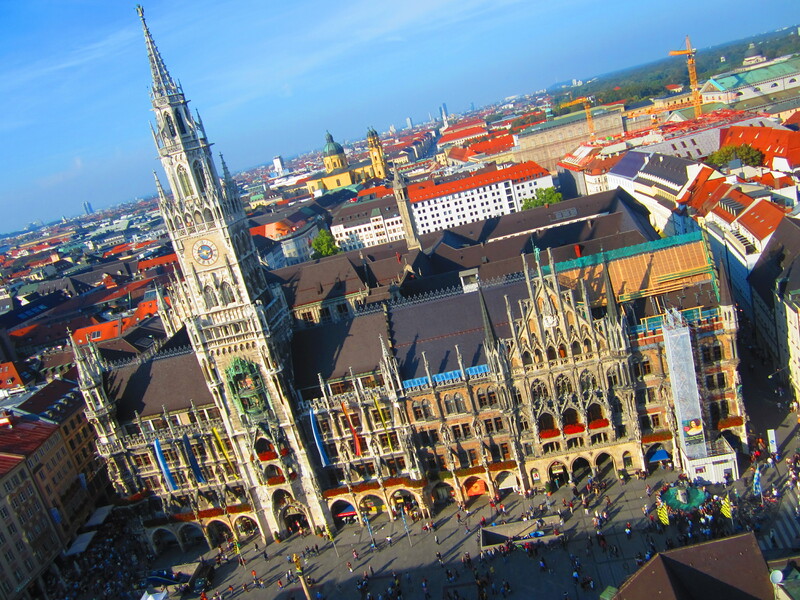 We made our way to Munich for the sole purpose of experiencing their gloabally-known three-week long beer and food festival: Oktoberfest. Fresh off of a eight hour flight, we made our way to this: One of the 16 “tents” (aka massive buildings that host local Munich breweries for this day-long drinkfest) Löwenbräu brewery is where we started our insane adventure, and we had a plenty of these five-pounders of German goodness: As I mentioned, I wasn’t thrilled about German food going into this trip but, I was seriously mistaken. 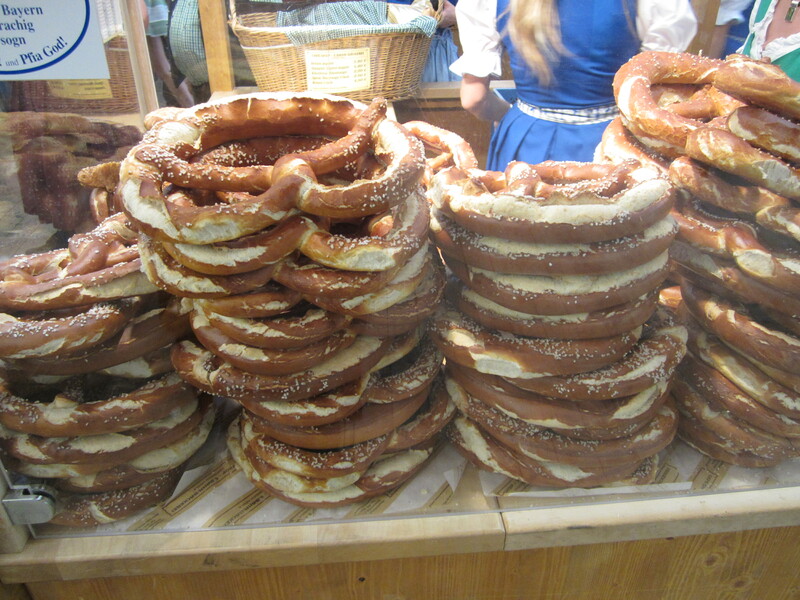 First off, the Germans take the cake on Philly’s proudest delicacy: my fave… the pretzel. I was in awe with the size and popularity of their massive pretzels at Oktoberfest and all over Munich. What truly made these fresh, salted pretzels delicious was the Bavarian-made sweet mustard. Heaven. For dinner, at our second tent stop and brewery, Hacker-Pschorr we had to add some traditional Oktoberfest fare to our drinking: Weisswurst (white sausage) with sauerkraut and Schweinshaxe with kartoffelknödel (hamhock and potato dumpling): Phew, both these dishes were absolutely outstanding. Hats off to the side dishes. The sauerkraut was fresh and packed with flavor to the point that I could pretty much eat it alone. But honestly, the kartoffelknödel was probably my favorite item of these two dishes. A savory poached dumpling-like, almost mashed potato ball. DANG that killed it. I see you Germany. I am proud to admit that our night did not end there. After several drinks and a few German sing-a-longs on tables, Oktoberfest had to come to a close. So what was up next? More FOOD!! We hit up one of many outdoor food vendors at the fest and munched on Zweifache– double sausage sandwiches with mustard. 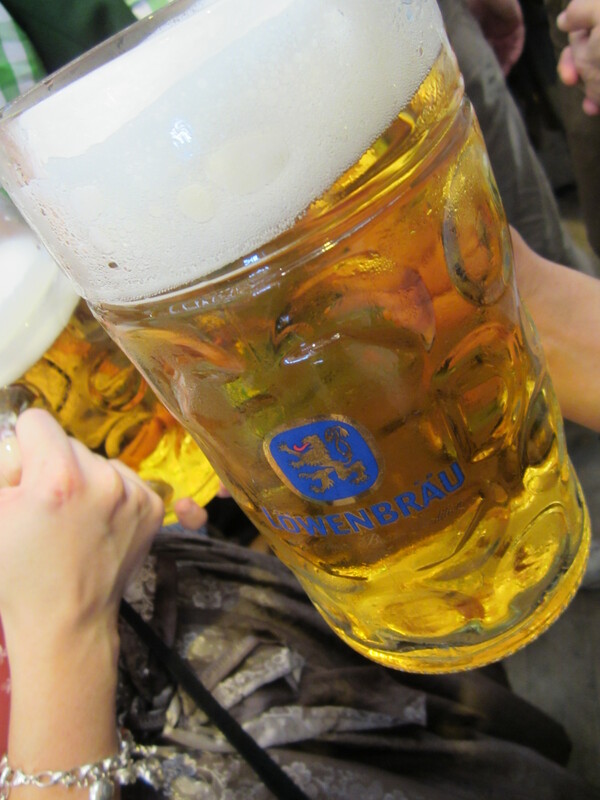 Bavarian Gut-ness!! 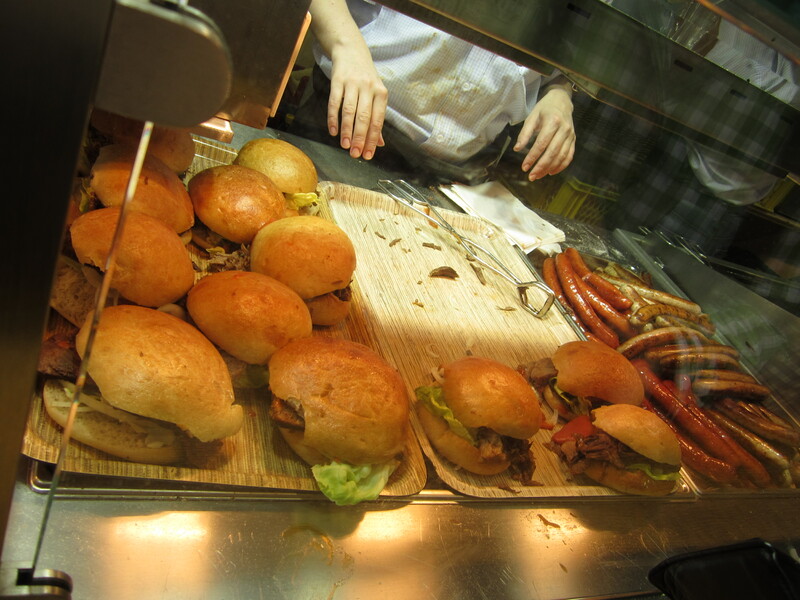 I think we were still on a sausage high at this point and skipped out on their beef sandwiches, pictured left. Once done, we hit the town in search for some good ol’ German dancing in Munich. Instead, we stumbled upon CRUX hip-hop club that happened to host EPMD’s Erick Sermon as the DJ. Yup, odd, very odd. That was a sign for us to call it a night. 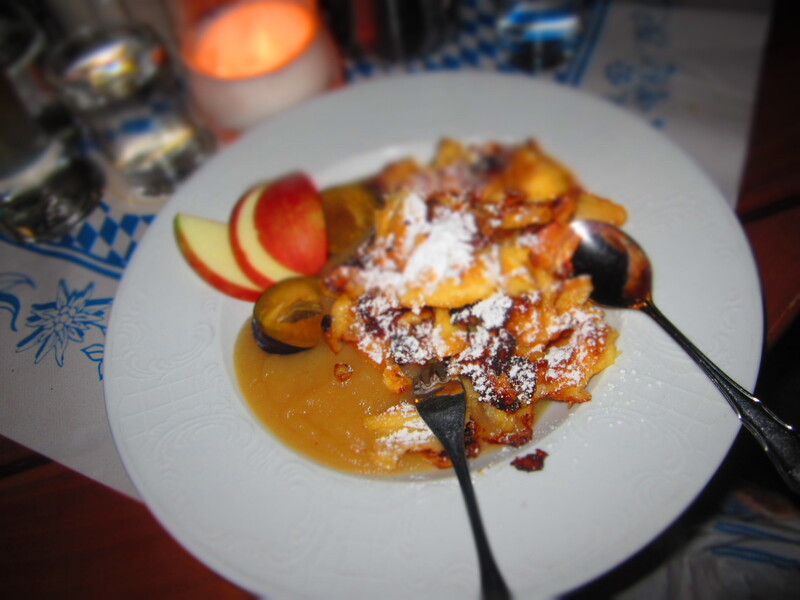 Kaiserschmarrn This delectable Austrian-German dessert was introduced to my tastebuds on my last night in Munich. “Schmarrn” translates as a mishmash, a mess, or crumbs, and that was exactly what it was. It is a caramelized pancake-like batter baked and prepared with sugary goodness. Served warm and with fruit. Wow. I think I am going to make that right now. 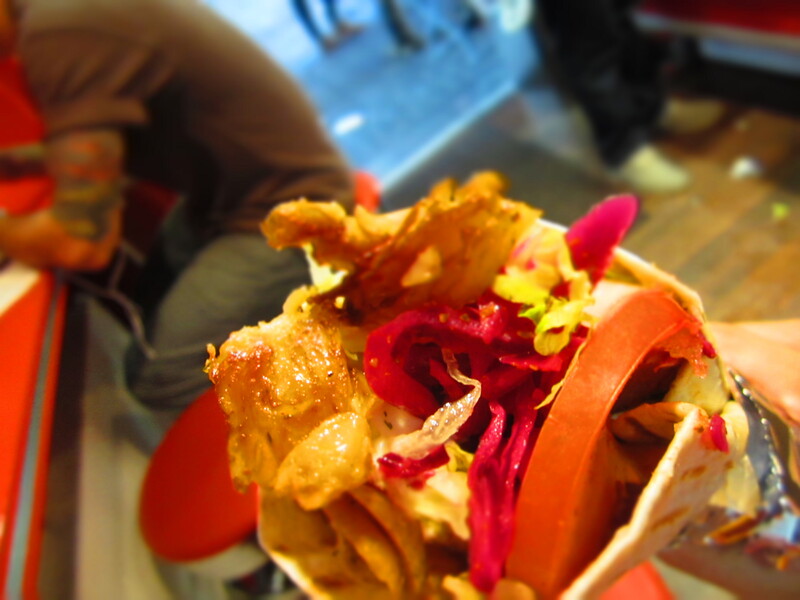 Döner Kebab Döner (rotating roast) Kebab, seen below, is meat, usually lamb cooked on a vertical roasting pool, and sliced to order. 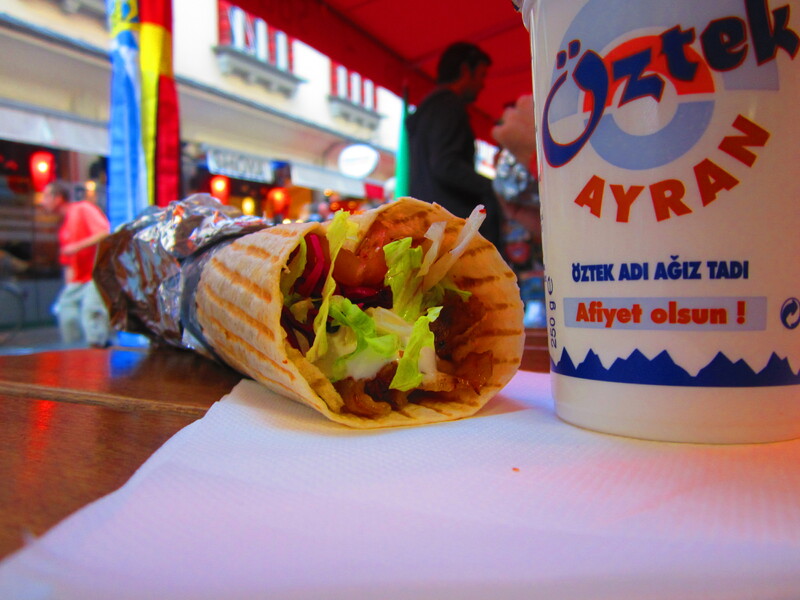 This scrumptious wrap (also can be on bread) is not necessarily a German novalty, but Turkish. However, since there are so many Turkish immigrants in Germany, it was clear that it is a popular treat found around Munich for those wanting eat something different… especially after a few beers. So we had to go in!! Although I skipped out on it, it is common to have these kababs with a yogurt drink. A must travel bite when in Munich. This entry was posted on Tuesday, October 25th, 2011 at 9:06 am	and posted in Check It!, Travel Bites. You can follow any responses to this entry through the RSS 2.0 feed.